What is the Alpha Matrix? 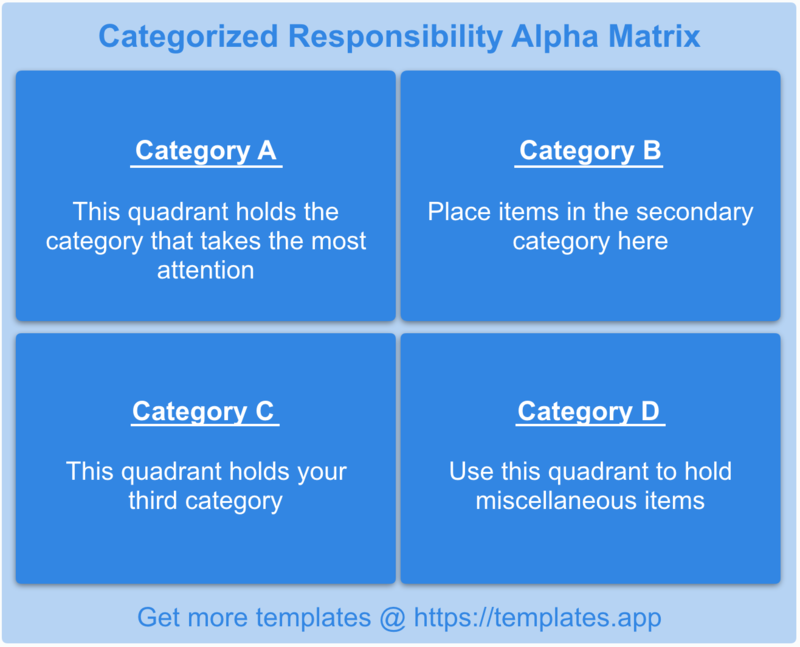 Using this 2×2 format, you can define and separate categories within the concept or project that your Alpha matrix represents. This categorization allows you to divide and conquer. This approach can clarify the situation showing when one aspect of the project you are focusing on is particularly challenging or time intensive. Realizations like this catalyze the creation of new methods to tackle the problem head on. 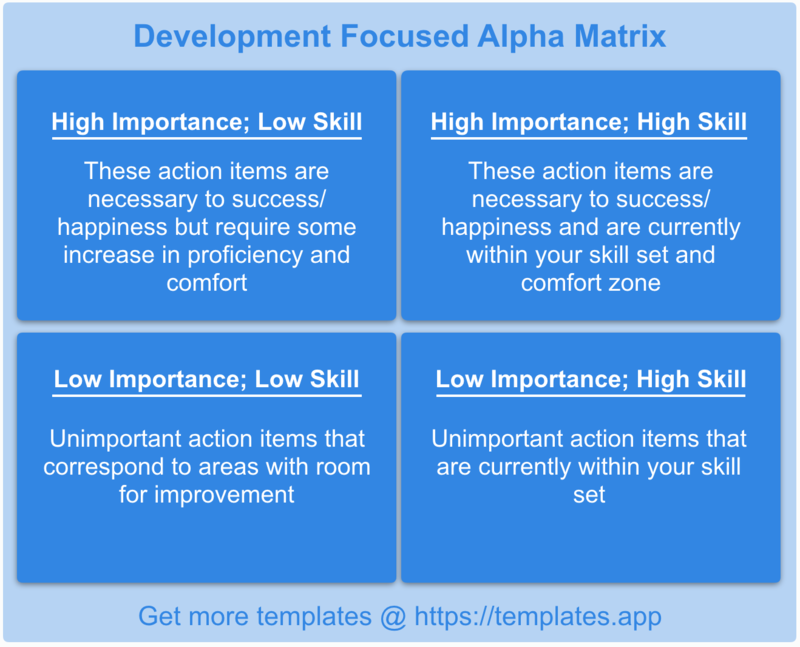 The Development Focused Alpha Matrix focuses on your tasks in the context of how important they are and how skilled you are in accomplishing them. These criteria not only help you determine what must be done without fail. They also highlight areas that you can develop yourself in and facilitate doing so. Using this template, you can work on important things that you would like to improve your proficiency in during times when you are most energetic, while falling back on important tasks within your comfort zone and skill set when you have less energy. Finally, when you have ensured that these tops actions are accomplished, you can focus next on the tasks that, while relatively unimportant, correspond to areas where you wish to improve your strengths. 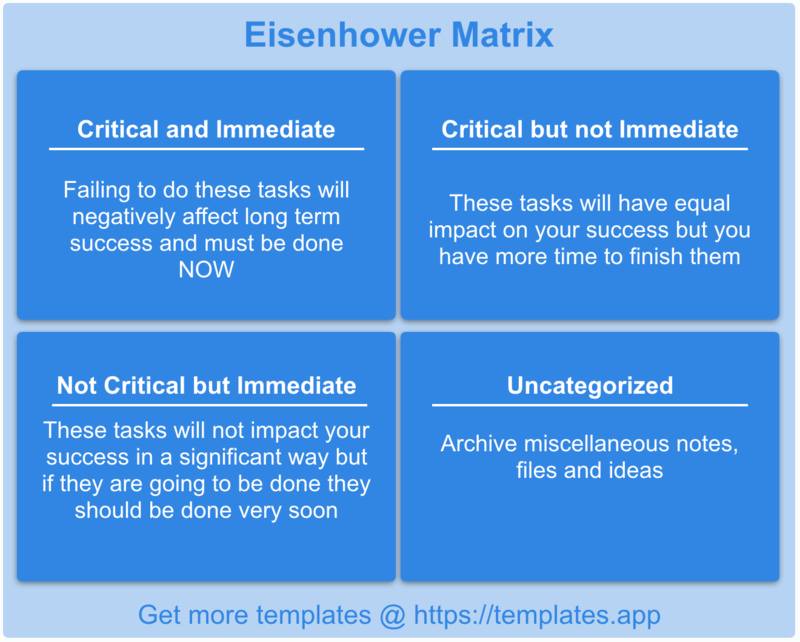 If your Alpha project is suffering because you are spending too much time thinking about and working on unimportant things, while the important things are always done at the last minute, with barely enough time to spare, the Eisenhower Matrix might be the perfect format for you. This template has been proven to increase prioritization and improve decision making.